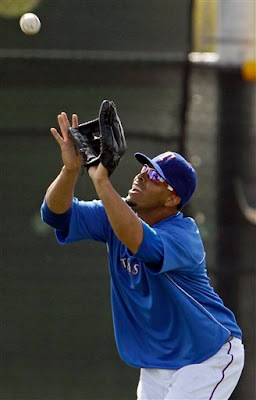 Sully Baseball: I see Nelson Cruz has no problem catching THIS ball! I see Nelson Cruz has no problem catching THIS ball! I guess he didn't have to leap. Poor guy is getting Buckner-like treatment! Bottom line is that Freese's triple was really well hit and Texas pitching caved. And Texas still could have won Game 7 if they didn't look like such a sorry sack of losers throughout the whole game. hahaha I think that Nelson Cruz needs some extra practice or training because I have seen him failing some easy balls that I would even catch!! I've learn some excellent stuff here. Definitely value bookmarking for revisiting. I wonder how so much effort you set to create this kind of magnificent informative web site. Simply wish to say your article is as astonishing. The clarity to your submit is just spectacular and i can suppose you're an expert in this subject. Fine together with your permission allow me to clutch your feed to keep up to date with coming near near post. Thank you 1,000,000 and please continue the enjoyable work.